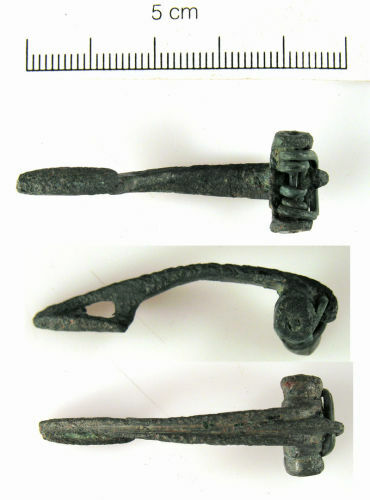 Copper alloy brooch of Colchester derivative, Polden Hill (Mackreth Group 5, flat wing ends type, Western Group), Mackreth 2011, 5.b4.Plate 50, dating to c.75-175AD. It is complete except for the pin. The spring is attached by a pierced crest on the head and is wrapped around an axis bar which is enclosed in a springcase with capped ends. The bow is decorated with a raised central ridge at the top and raised edges. The catchplate has a triangular peforation.